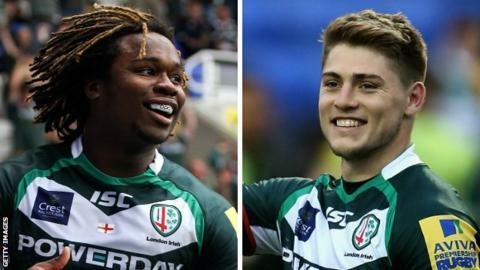 London Irish director of rugby Brian Smith is hopeful the arrival of new investors at the club will result in them keeping hold of star duo Marland Yarde and James O'Connor. England wing Yarde, 21, and Australia back O'Connor, 23, are both out of contract at the end of the season. On Thursday the club announced a takeover by an Irish consortium, who have pledged "substantial investment". "We are putting out best foot forward," Smith told BBC Sport. In recent years the club have seen prized assets such as Delon Armitage, Jonathan Joseph and Alex Corbisiero leave but Smith is confident Yarde, who broke into the England team this summer, will not be another one. "In the Premiership recently there has been a bit of a split between the have and have-nots which London Irish felt when they lost a number of home-grown players to the likes of Leicester, Northampton and Bath over the summer. "But this announcement today could well change the club's fortunes dramatically. "The new management are confident of keeping star player such as Marland Yarde and James O'Connor while the recruitment of World cup winning prop CJ Van der Linde is an early statement of the new owners' intent." "Some players have voted with their feet as they felt there was not enough ambition," he said. "We've stepped up to the plate with Marland and his management - we've put on the table exactly what he has asked for. We are hopeful. "We are very keen to keep our homegrown players and he is one of them. In saying that, every individual has got to make a decision. We feel we are a club going places and hopefully the significance of that helps kick several people over the line." O'Connor arrived at the club in October on a deal until the end of the season in an attempt to rescue his career, following a string of off-field incidents in his homeland of Australia. The full-back, who has played 44 Tests for Australia, had his contract terminated by the Australian Rugby Union but Smith says he is confident O'Connor may stay - if they can strike a deal with Wallabies national coach Ewen McKenzie. "I'm very hopeful," said Smith. "The club has welcomed James with open arms. He has been bowled over by the Irish welcome. "He fits in and I have not had any trouble from him in terms of a management point of view. He has been outstanding and takes time after training to coach the academy and other young aspiring internationals. "It is a deal we'll have to liaise with Ewen McKenzie on and make sure James is available for international selection and some of the Super 15. He is enjoying London and his girlfriend is over - that is important and I am hopeful." The new consortium is led by Mick Crossan, executive chairman of the club's primary sponsor Powerday. Crossan, who will become the club's new president, has set his sights on returning the club to the top four of the Premiership, pointing to the arrivals of O'Connor and South Africa prop CJ Van der Linde as evidence. One issue the club must address is whether they continue to play at Reading's Madejski Stadium, having been linked with a move to Brentford's new ground in Kew. However, executive chairman David Fitzgerald says they are contracted to the Madejski Stadium until 2025-26 and would prefer to stay there. He did reveal, however, that Irish have a get-out clause in their deal and were open minded about a move away if it made sense from a business point of view. "We average 9,000 and, quite frankly, there are quite a few clubs in the Premiership who would like to average that," Fitzgerald said. "We need to drive that number up, there is no doubt about it. It's a circular thing. "If you get the product right and the performances right on the field people will come and watch. We saw that a few years ago and we can get 20,000 for the St Patrick's Day game, and several other games we can get 10 to 15,000. "The model is to drive that number up and once we do that everything can be reinvested back into the playing side. "We will not rule out other opportunities if they arise that make sense from a business point of view. We do not want to alienate out support base. We've been in Reading for 13 years."